Depending on your perspective, the campaigns for a remain/withdrawal vote in the EU referendum have had between six weeks (since David Cameron announced the date of the referendum on 20th February) or more than two years (since David Cameron announced that the plan to hold a referendum would be in the Conservative Party manifesto for the 2015 general election) to put their case to the British public. Even though the ‘official’ referendum campaign has yet to begin, both sides have spent vast sums trying to win over supporters to their cause since 2013. We have shown in this project that a key source of support for the Remain campaign is young people, who are overwhelmingly supportive of EU membership and tend to have a far more optimistic impression of its performance. What is less clear is the extent to which this is a result of the campaigning efforts of those wishing to remain in or withdraw from the EU, and the extent to which it reflects lasting generational differences in how the EU is viewed. The graph below shows the net remain/leave scores for the under 25s and wider electorate from YouGov surveys since January 2013 and allows us to examine this issue. The net scores are calculated by subtracting the proportion who want to leave the EU from that who wish to remain: the higher up the y-axis, the more supportive of EU membership. The data shows that the under-25s were largely supportive of the UK’s EU membership before David Cameron announced his plan to hold an in/out referendum in January 2013: they had a net remain/leave score of +22%. This compares with a score of +4% for the over-25s. The under-25s have also become steadily more supportive of EU membership since then: by the end of 2013, their net score was +31%; by January 2015, it was +40%, and by January 2016 it was +46%. 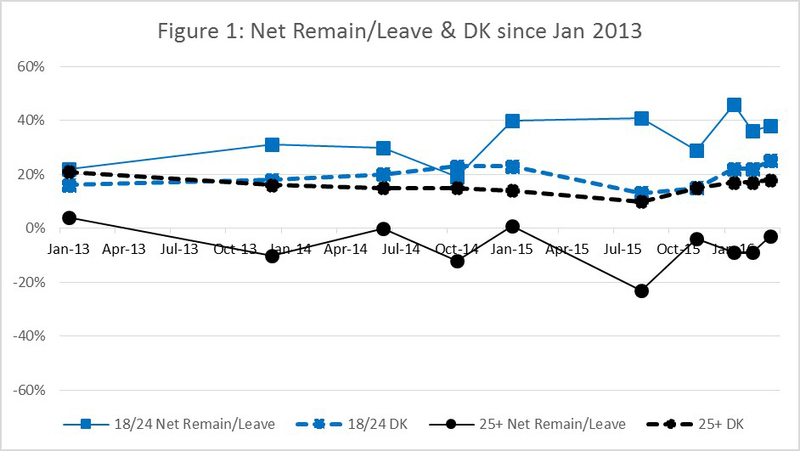 Between January 2013 and the most recent poll in March 2016, the under-25s net remain/leave score has increased by an average of 0.5% per month. The trend has not been constantly upward, however: there were two notable drops in October 2014 (when the media was dominated by the disagreement between the UK government and the EU about an outstanding £1.7bn contribution to the EU budget), and in November 2015 (just after David Cameron announced the outcome of his renegotiation of the UK’s EU membership). This suggests that while the under-25s have become steadily more supportive of EU membership since the prospect of a referendum was seriously raised in 2013, that support can still be undermined by events which highlight the negative aspects of the country’s relationship with the EU. The data for the over-25s shows that their support for the EU has also changed since 2013, however in their case this shift was both smaller in magnitude, and towards a more Eurosceptic position. In January 2013 they had a net remain/leave score of +4%; by December 2013 it was -10%; by January 2015 it was 1%; and by January 2016 it was -9%, before rising slightly to -3% in the latest survey. The over-25s net score has fluctuated more than that of young people, but has nonetheless become on average more negative, by -0.2% since January 2013. While the over-25s became generally more Eurosceptic in October 2014 – along with the under-25s – there was an additional Eurosceptic surge in August 2015 which was not mirrored in young people. This coincides with intense media coverage of the migrant crisis in Calais, when daily updates were provided to the British public on the growing number of migrants seeking to enter the UK that were camped there, with some dying in their attempts to cross the channel through the Eurostar tunnel. The fact that this had such an effect on the support for EU membership of the over-25s but not the under-25s is probably a reflection of the relative lack of hostility towards immigration and migrants exhibited by young people. This data suggests, therefore, that not only could events and media stories related to migration be particularly toxic for support for EU membership among the over 25s, but that they could also widen the generational divide in EU support between young and old. Finally, the graph also shows the proportion of respondents who don’t know how they will vote in the EU referendum, for both the under and over-25 age groups. With the exception of a short-lived decline in August 2015, the proportion has remained generally constant at an average of 20% for the under-25s and 16% for the over-25s since January 2013. On the one hand, this might be a cause for optimism for the Remain and Leave campaigns, as there is still a substantial minority of voters who have yet to decide how to vote and could still be persuaded to support their position. On the other hand, the fact that the proportion of ‘don’t knows’ has remained so steady while young people have become generally more pro-EU and older people have become more Eurosceptic might suggest that the campaigns are failing to get through to those who genuinely have no idea how they will vote in the referendum. This data suggests that the age-gap in support for EU membership is getting – albeit slightly – larger. While it is clear that young people were substantially more pro-EU than their elders before David Cameron announced his plan to hold a referendum in 2013, there is evidence that the ongoing debate about EU membership is solidifying the support young people have for the EU and the hostility their elders have towards it. By far the most substantial changes for both groups, however, have occurred when the downsides or challenges associated with EU membership have been propelled to the centre of the media spotlight. A recurrent theme of this study has been to highlight the problem for the Remain campaign stemming from their dependence on the Millennial generation for a substantial chunk of their support because of the latter’s reluctance to vote. Another serious concern, however, is the prospect of another event or sustained campaign which highlights the negative sides of EU membership – particularly relating to immigration – between now and polling day. The data above shows that the impact of such on support for EU membership will probably be far greater than anything the mobilising efforts of the Remain and Leave campaigns are likely to achieve.